click photo to enlarge This is the start of what used to be a road but is just a hiking trail. All of the rain that we have had here in Southern California in 2005 has made this trail and the mountains much prettier then they usually are. 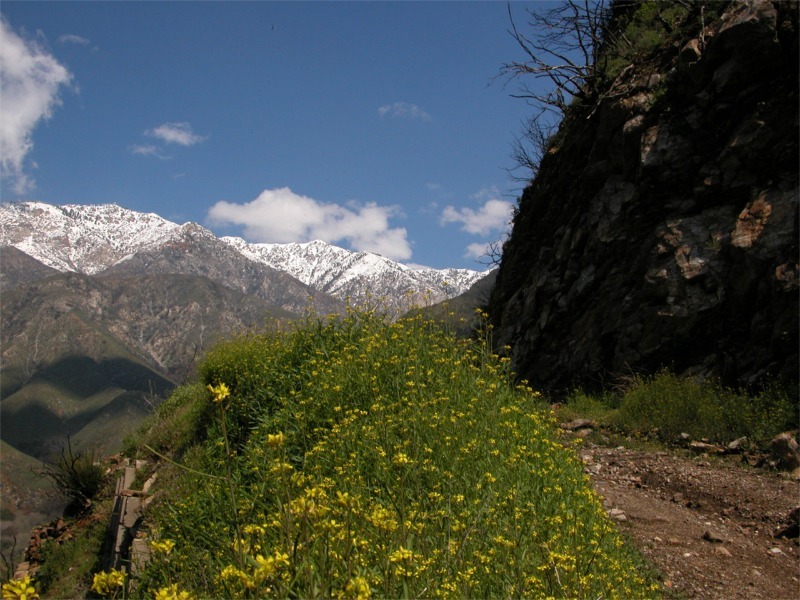 The rain has also permanently closed this trail / road to any form of vehicular traffic. I used to come up here on our dirt bike on occasion. 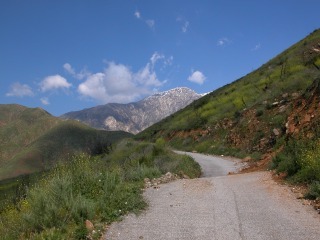 The trail, The San Sevaine Trail, goes into the Cucamonga Wilderness. click photo to enlarge On this hike we will go 5 miles round trip and go up in elevation 2,000 feet. If you go back 14 miles it goes to the Joe Elliot campground. There are a lot of spring wild flowers along the trail. 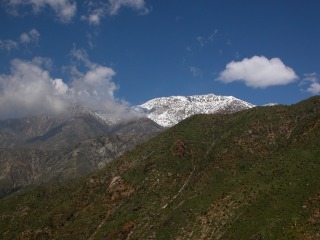 click photo to enlarge The mountain in the background is Cucamonga peak, elevation 8859 ft.. In the four years we have lived here I have never seen the mountains so green. 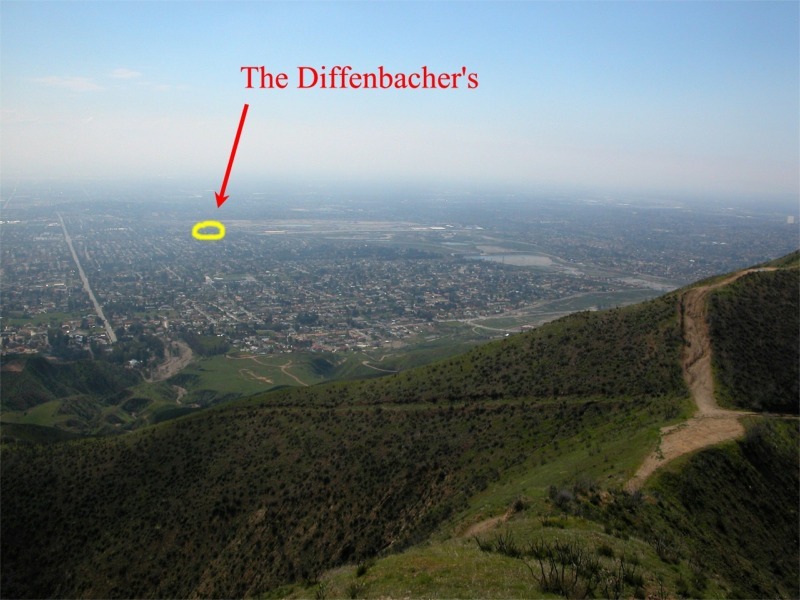 click photo to enlarge At 3.7 miles there is an area where hang gliders used to launch from. 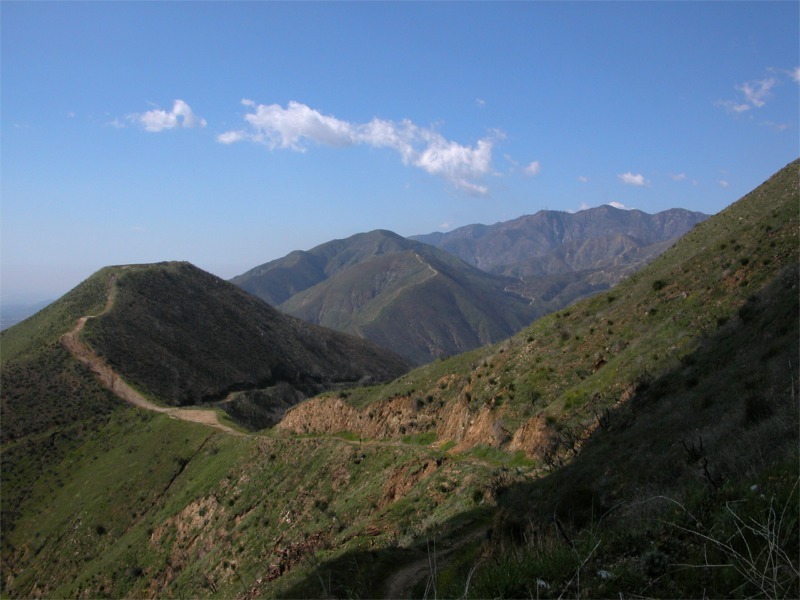 I have been told that one of the vehicles of choice in the 60's and 70's for driving these mountain roads was the Volkswagen Beetle. We saw one that went over the edge. I believe the beetle was used because it was inexpensive and with the weight all on the back wheels could climb the mountain road. I have not been able to find information to confirm or deny this. But we have seen a few of them over the edge while hiking the mountains. 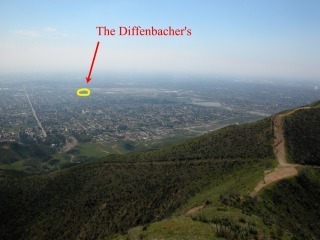 click photo to enlarge Looking down the mountain I have circled our house. At this point we are about 2,800 feet above it. I borrowed a GPS to take on the hike because I wanted to know how far we hiked and how much change in elevation.